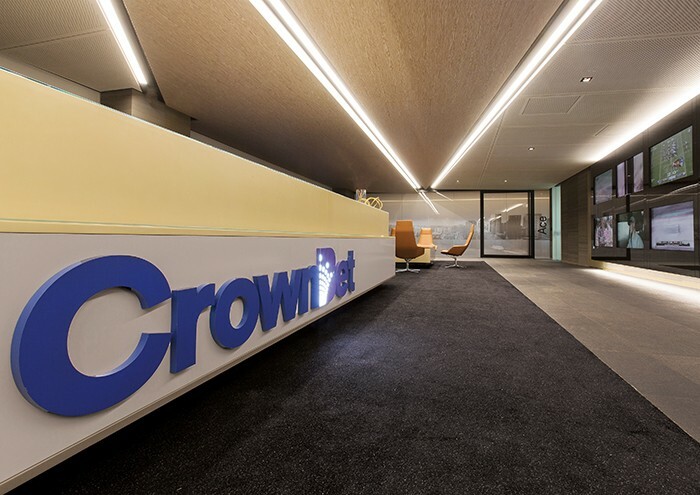 ODC Design was appointed by CrownBet to provide the complete package of full design, documentation, project management and construction for their new offices located on Levels 25, 26, 27 and 28, 120 Collins Street in Melbourne, a total of 4,847 sq. metres of floorspace. The client desired a fit out encompassing warmth and sophistication, as well as a design to reflect their dynamic and tech-savvy culture. The front of house area on Level 27 was created as an impressive and elegant space with high-end finishes to correspond with the A Grade building and the “Crown” brand of which the company now occupies. The building’s panoramic view of Melbourne’s city scape was exploited making use of full height glazing to the large 18 person showcase boardroom and 10 person meeting room fronts. Natural blue granite specified throughout the flooring creates grandness to the space. On Level 26, innovative meeting pods were designed for informal gatherings or an alternative workspace. The floor is home to IT and Solutions infrastructure to maintain a level of quality assurance to the business. The team has direct access to UPS rooms / large communications data room, IT build room and Networking Centre Area. Risk and Traders located on Level 25 required the installation of over 300 No. LED screens and monitors to accommodate their live betting and sporting events. The layout was purposely built for staff to have maximum eye contact to raised supervisor desks and screens when viewing live sports, in addition to extra supplementary air conditioning units were installed to preserve staff comfort. The opposite side of the floor was designed for the Customer Service business where call centre’s workstation model was adapted. The entire floor was designed to run 24 hours a day, seven days a week. Level 28 is dedicated to the marketing department and includes a fully equipped TV studio housing a control room, editing space, audio and make-up rooms. Collaborative areas and casual meeting spaces were also created to meet the need for an open and communicative environment within their marketing department including compact areas incorporated for quick meet discussion groups. Other features include custom designed L shaped workstations made to raise height desk and also include special features such as hoop leg detail and acrylic write-able screen surfaces.